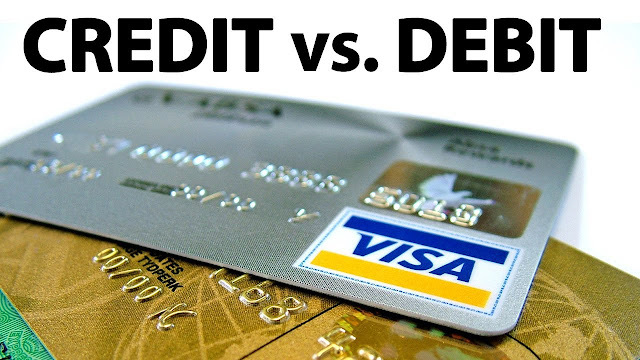 Credit vs Debit : Know the Difference. You probably have at least one credit card and one debit card in your wallet. The convenience and protection that they offer are hard to beat in many instances, but they have important differences that could substantially impact your pocketbook. Here's how to choose which one to use when you need to swipe the plastic. Credit and debit cards typically look almost identical, with 16-digit card numbers, expiration dates and PIN codes. But that's where the similarity ends. Debit cards allow bank customers to spend money by drawing on funds that they deposited with the card provider. Credit cards allow consumers to borrow money from the card issuer up to a certain limit in order to purchase items or withdraw cash. Credit cards are issued as either standard cards, which simply extend a line of credit to their users; rewards cards, which offer cash back, travel points or other benefits to customers; secured credit cards, which require an initial cash deposit that is held by the issuer as collateral; and charge cards, which have no preset spending limit but often do not allow unpaid balances to carry over from month to month. Credit cards generally work with your signature. Not so for debit cards. Some debit cards require using a PIN for every transaction, while others allow the customer to use a signature instead. There are also two types of debit cards that do not require the customer to have a checking or savings account. Electronic Benefits Transfer (EBT) cards are issued by state and federal agencies to allow qualifying users to use their benefits to make purchases. Prepaid debit cards give non-bank customers a way to make electronic purchases up to the amount that was paid in. Fees: Frugal consumers prefer to use debit cards because they usually have few or no fees of any kind unless users spend more than they have in their account and incur an overdraft fee. A 2006 report by TNS Financial Services Consumer Credit Card Program revealed that about three-fifths of consumers who used debit cards did so because it felt more like using “real money.” The no-fee advantage doesn't hold for prepaid debit cards, which frequently charge activation and usage fees, among other costs. By contrast, credit cards generally charge annual fees, over-limit fees, late-payment fees and a plethora of other fees and penalties, in addition to monthly interest on the card's outstanding balance. Rewards: Credit card users can reap cash, discounts, travel points and many other perks unavailable to debit card holders by using rewards cards. Smart consumers who can pay off their cards in full and on time every month can profit substantially by running their monthly purchases and bills through them. Credit scores: Credit card use is also reflected on the customer’s credit report, which allows responsible spenders to raise their scores with a history of timely payments. Warranties: Credit cards can also provide additional warranties or insurance for items purchased that may exceed those of the retailer. If an item bought with a credit card becomes defective after the manufacturer’s warranty has expired, for example, it's worth checking with the card company to see if it will provide coverage. Legal protection: These are also notably different, with credit cards offering more security. Liability for lost or stolen cards: Credit cards still offer much greater protection in most cases for those whose cards are lost or stolen. As long as the customer reports the loss or theft in a timely manner, his/her maximum liability for purchases made after the card disappeared is $50. The Electronic Funds Transfer Act gives debit card customers the same protection from loss or theft – but only if the customer reports it within 48 hours of discovery. After 48 hours, the customer’s liability rises to $500; after 60 days there is no limit. Disputing transactions: The Fair Credit Billing Act allows credit card users to dispute unauthorised purchases or purchases of goods that are damaged or lost during shipping. But if the item was bought with a debit card, it cannot be reversed unless the merchant is willing to do so. What's more, debit card victims don't get their refund until due process has been completed? Credit card holders, on the other hand, are not assessed the fraudulent charges made in their names. While some credit and debit card providers offer zero-liability protection to their customers, the law is much more forgiving for credit card holders. Car rentals: If you need to rent a car, most credit cards provide some sort of waiver for collisions. Even if you want to use a debit card, many car rental agencies require customers to provide credit card information as a backup. The only way out for a customer may be allowing the rental agency to put a hold of perhaps a few hundred dollars on his or her bank account debit card as a form of surety deposit.